to buy additional containers of coconut wine to sell and other supplies needed in her business. Wilma benötigte 300 US-Dollar, um ein Gewerbe im Bereich Nahrungsmittel auf- oder auszubauen. Das Geld wurde gesammelt und für Wilma bereitgestellt. Wilma, 40, has three children, all of whom are in school. She is a very hardworking entrepreneur. Wilma has a coconut wine vending business in the Philippines. 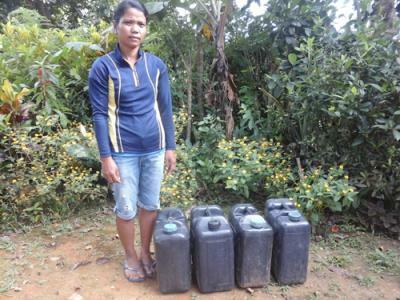 Wilma requested a PHP 15,000 loan through NWTF to buy additional containers of coconut wine to sell and other supplies needed in her business. Wilma has been in this business for 4 years. In the future, Wilma would like to save enough money so she can afford to send her children to college.